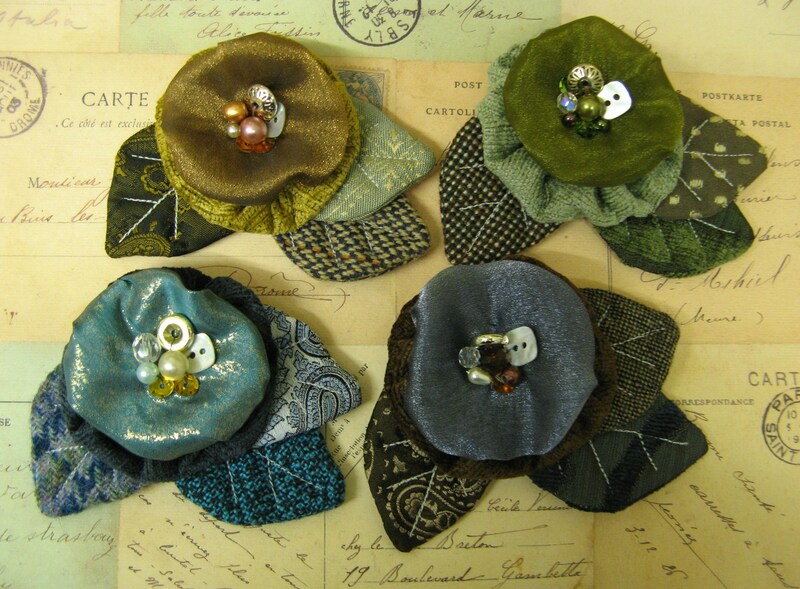 I was having a (much needed) tidy and sort through of my fabrics recently and thought it would be nice to combine lots of different textures and make some new corsages for Autumn/Winter. 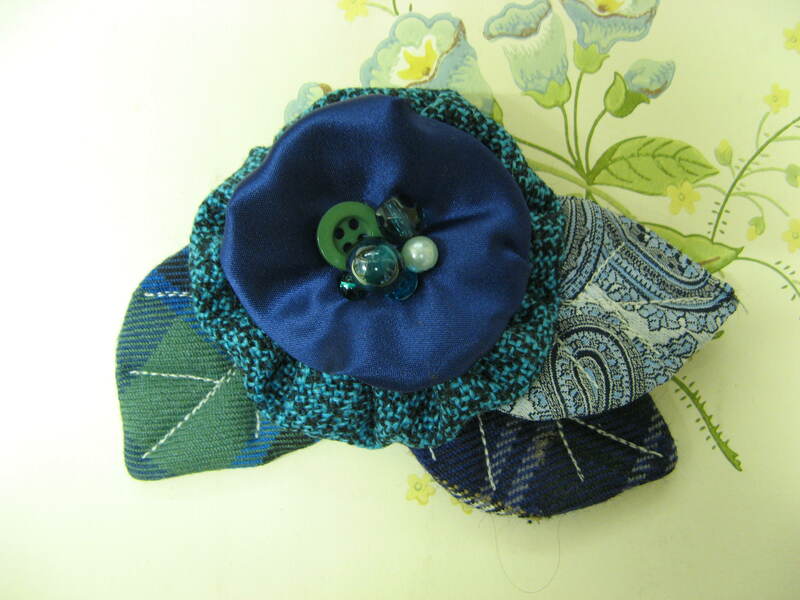 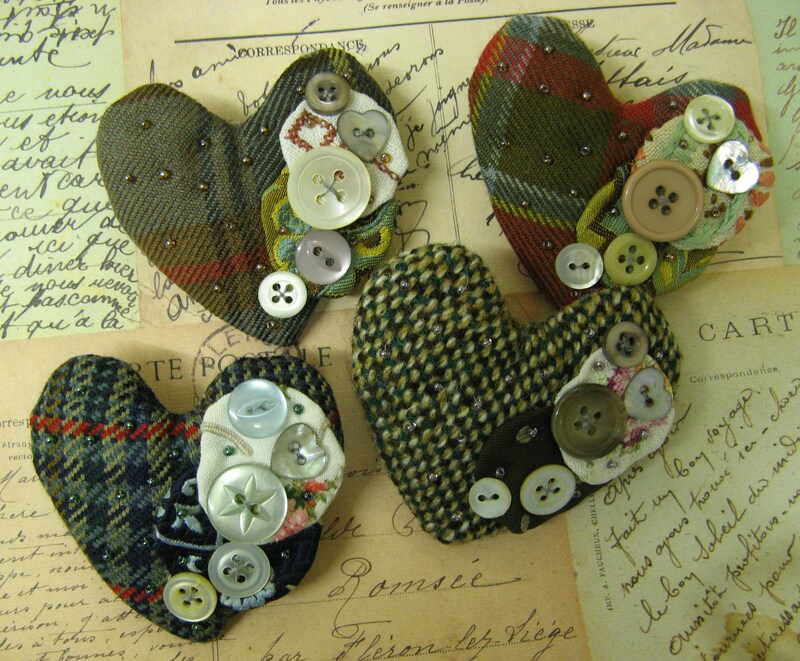 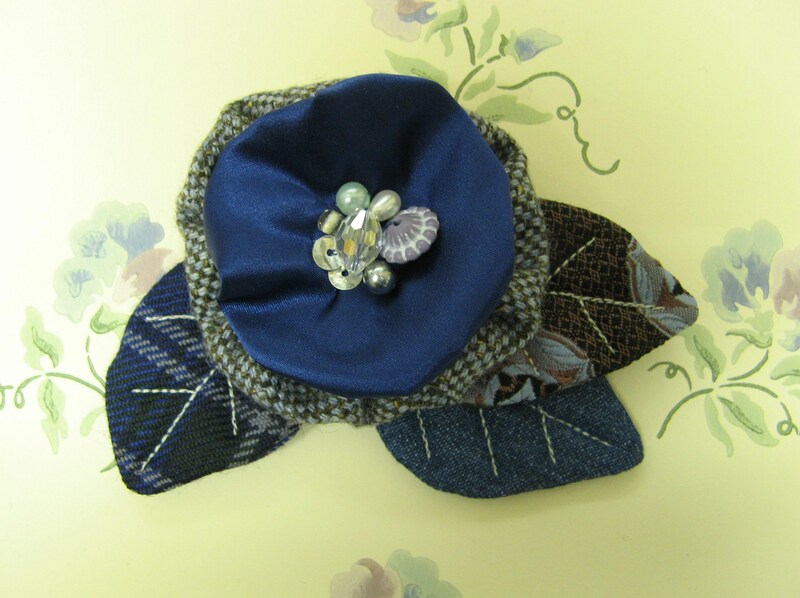 The flowers are made from lots of different recycled fabrics, including tweeds, tartans, corduroy, denim, vintage ties, satins, velvets and silks. 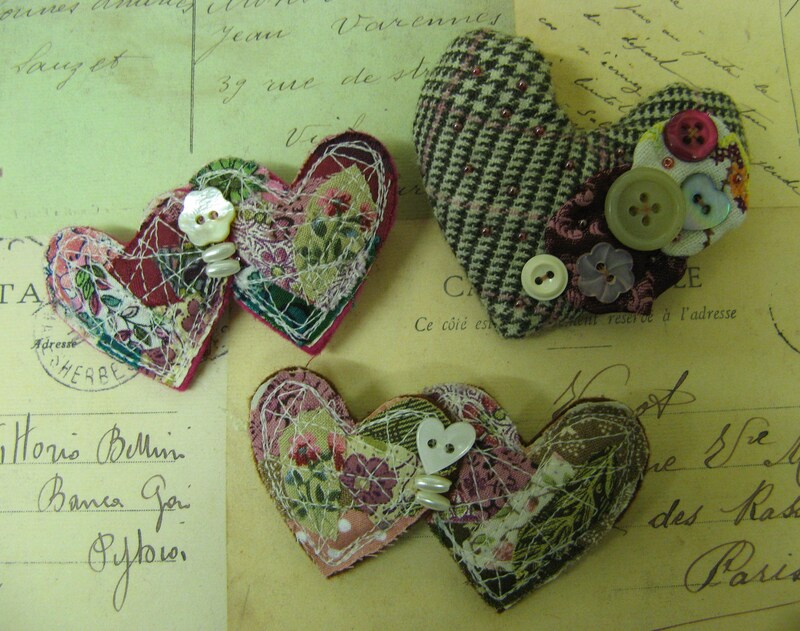 They have a sprinkling of vintage bits and bobs in their centres- buttons, beads, crystals and sequins. 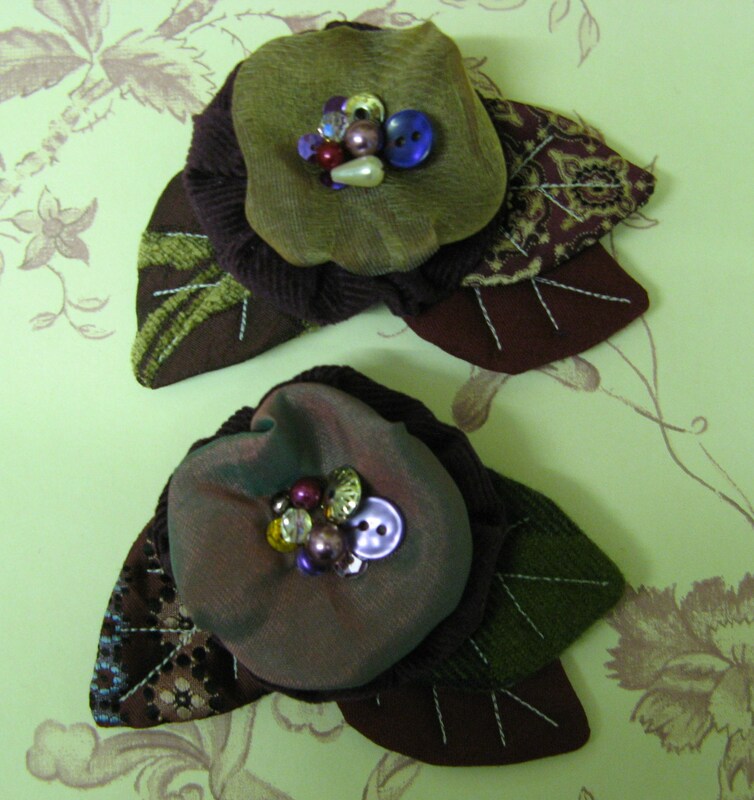 I enjoyed playing with all the combinations of textures and was quite pleased with the jewel-like effect. 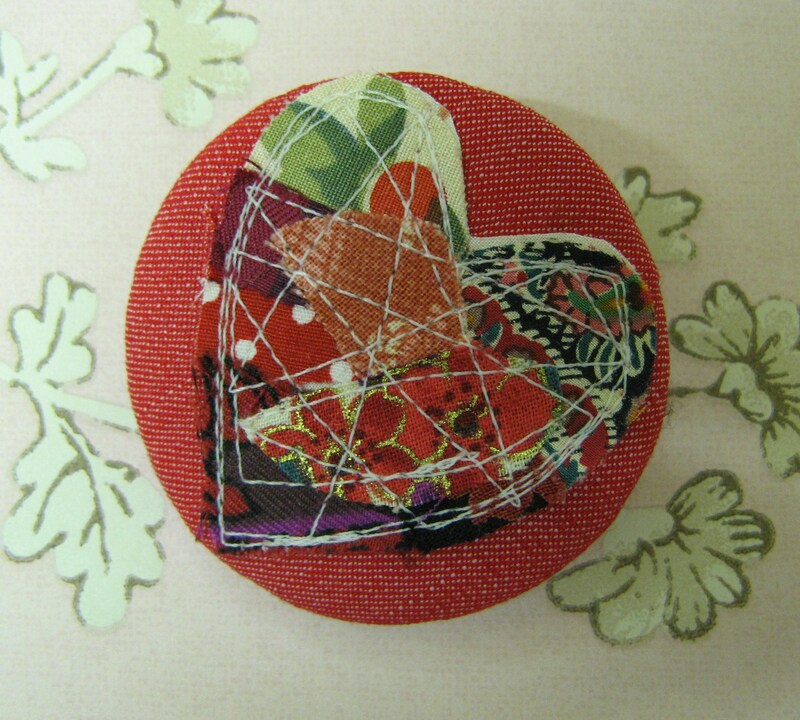 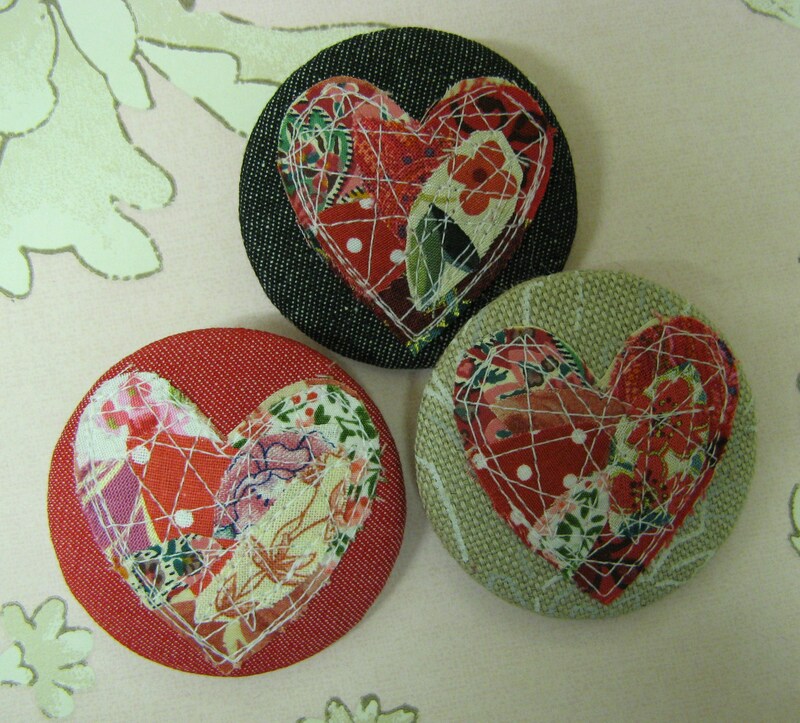 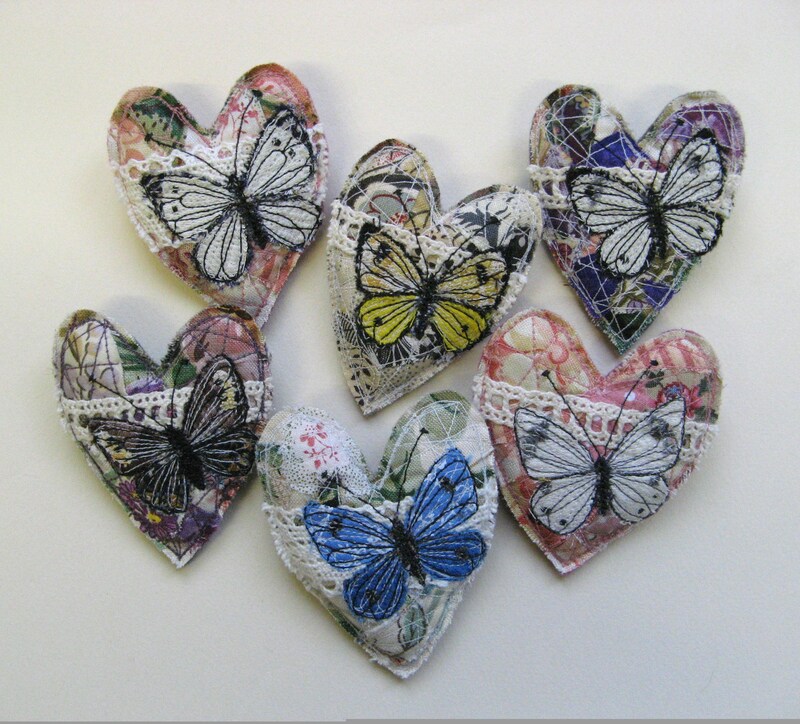 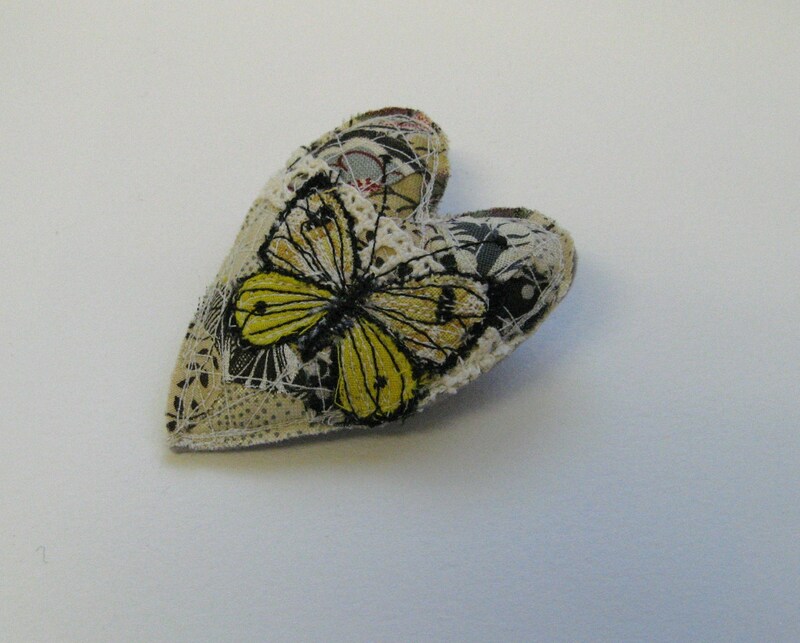 My first batch of these brooches have gone straight into Flux, Fabhatrix, and the Lucie Fenton Gallery. 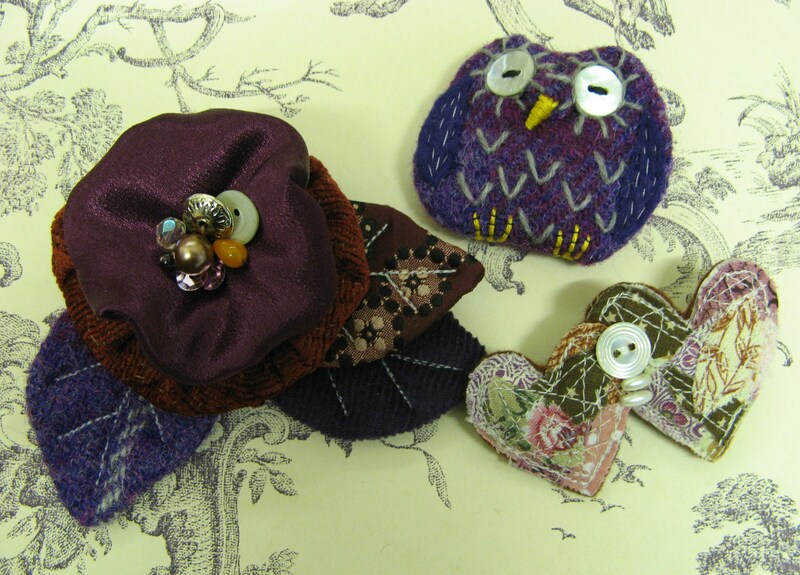 I`m now working on another lot, all made in lovely berry colours, which should be ready in a few days. 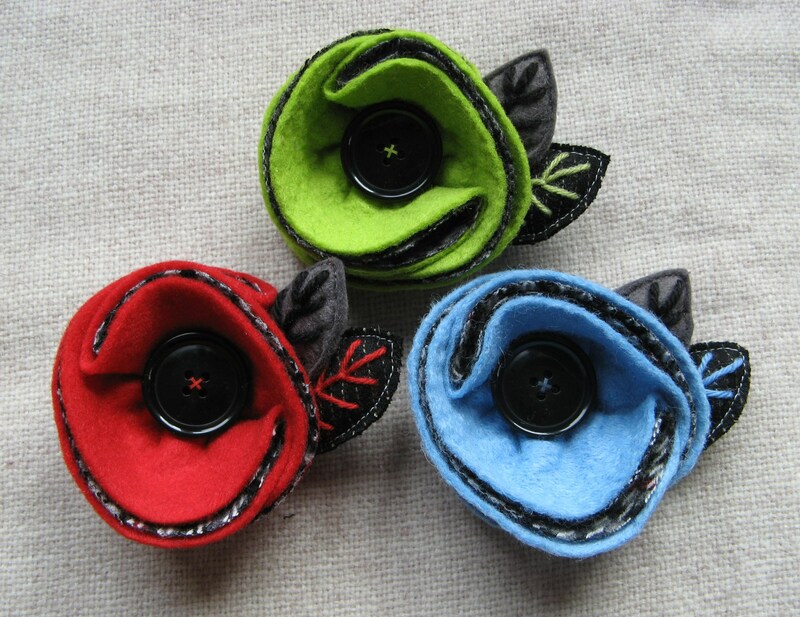 These felt poppies are probably my best sellers. 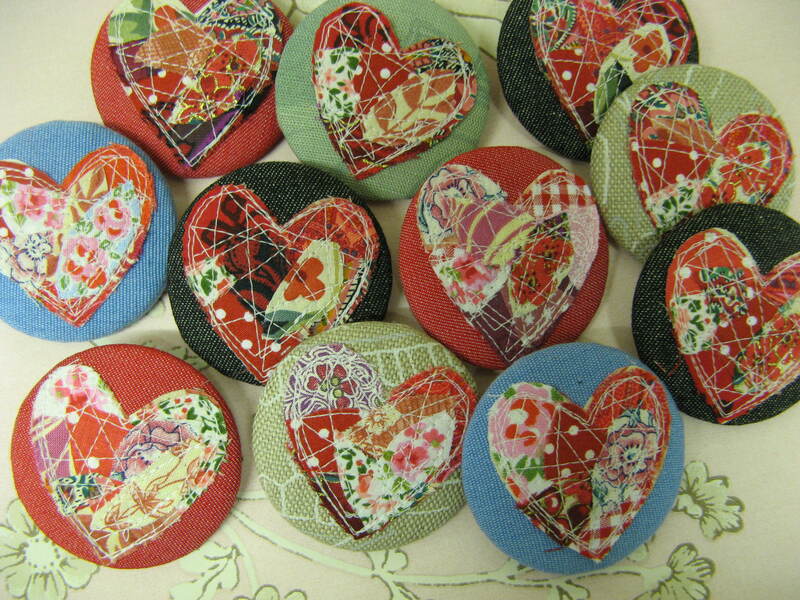 I`ve been making them for two or three years now, but I always have to make a few every week to keep topped up. 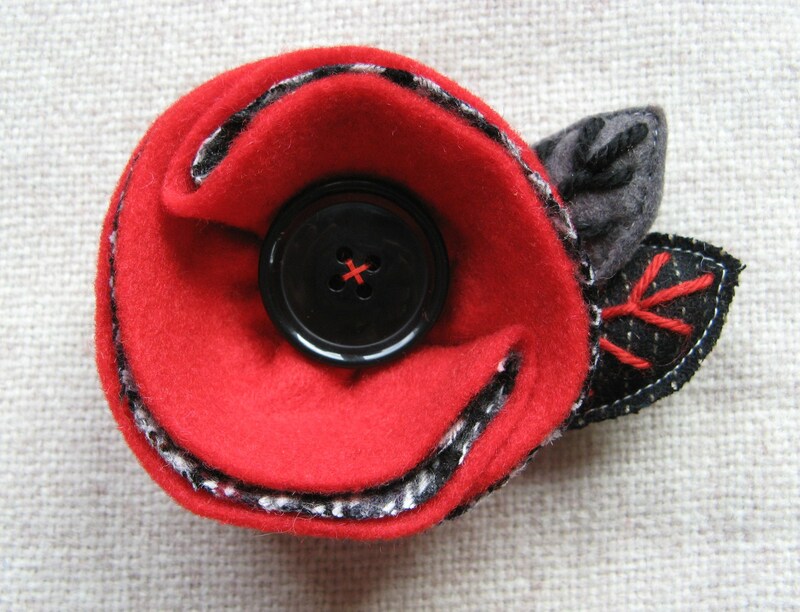 The poppies are made from layers of felt and recycled tweed with a shiny black button at the centre. 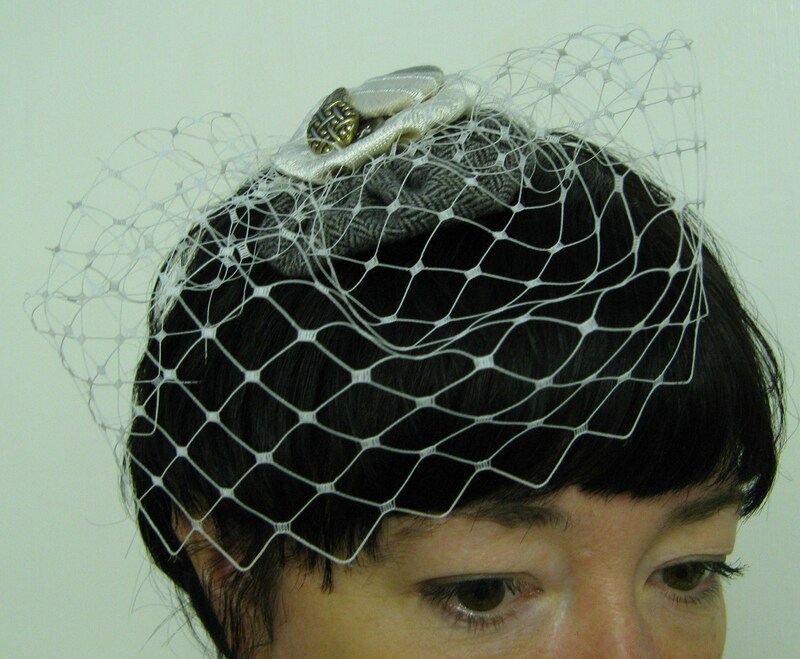 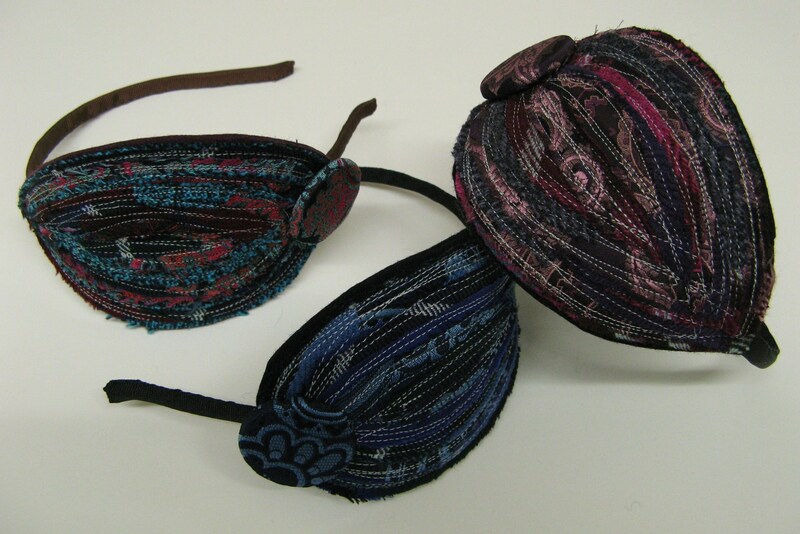 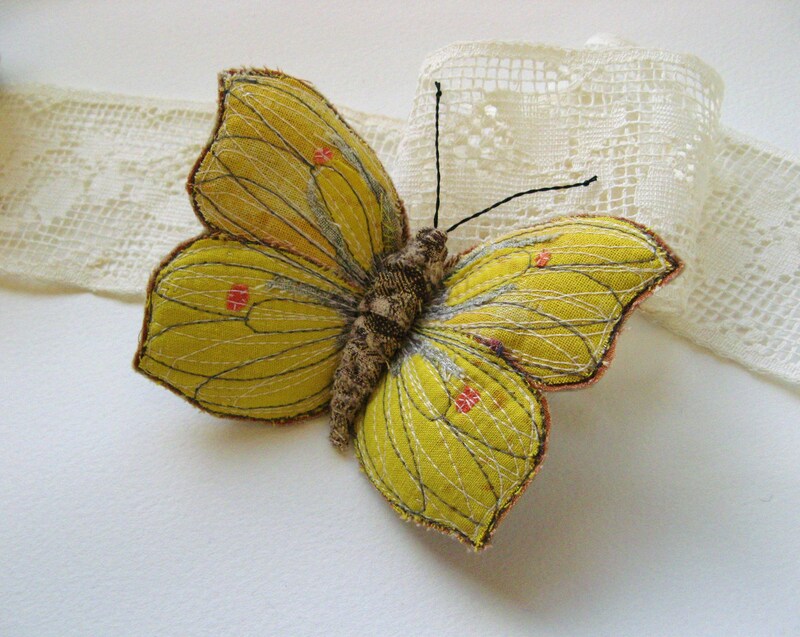 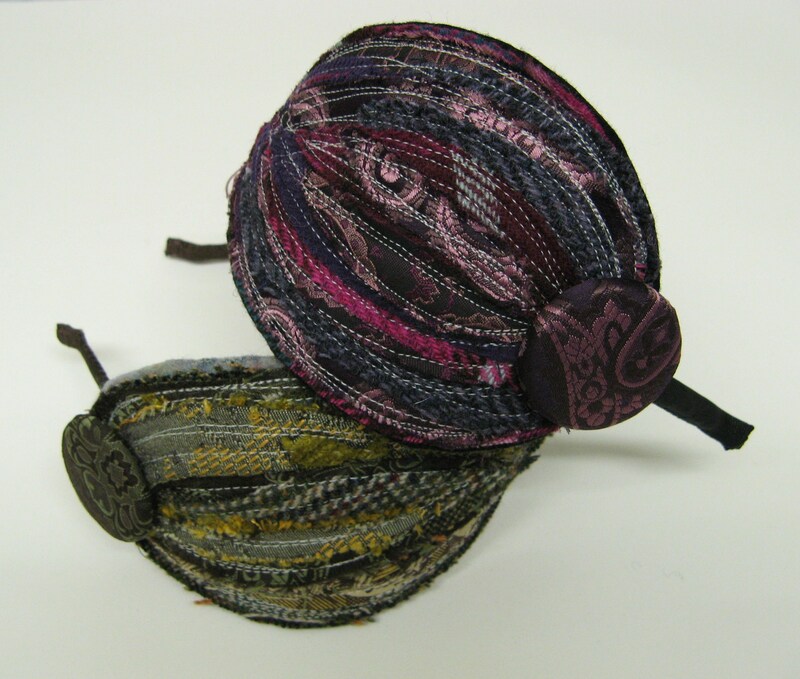 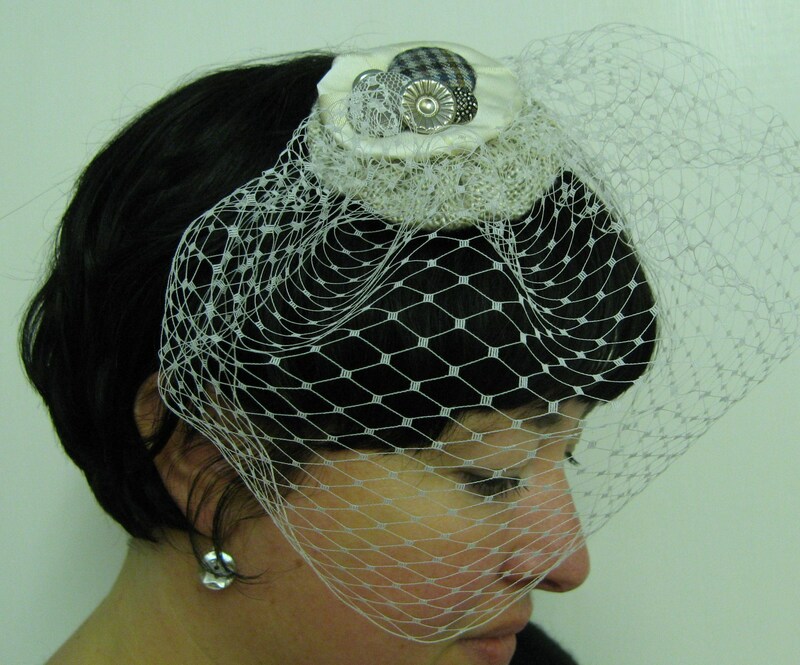 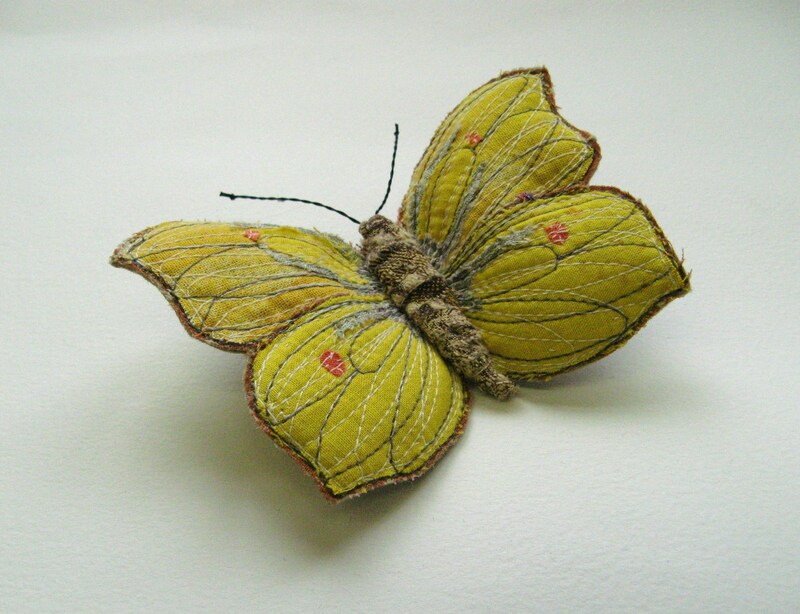 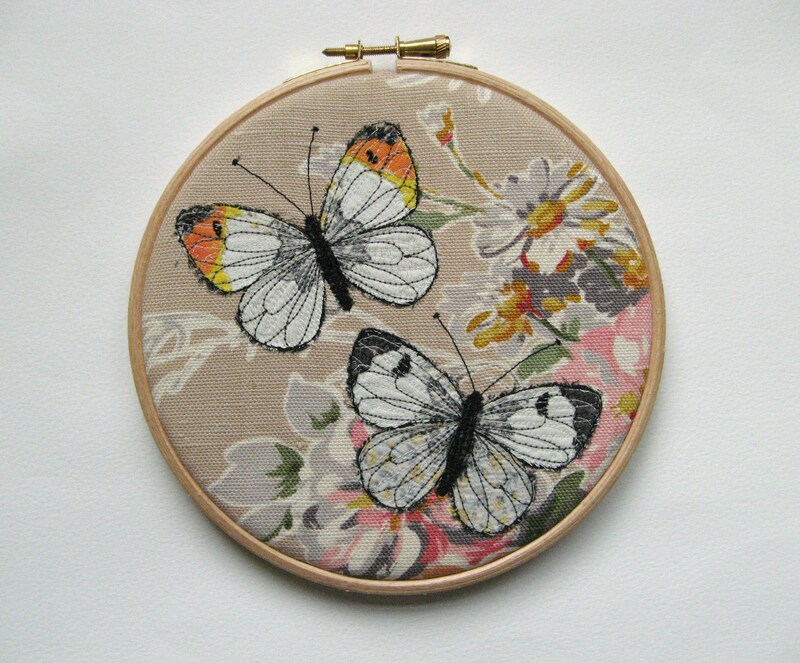 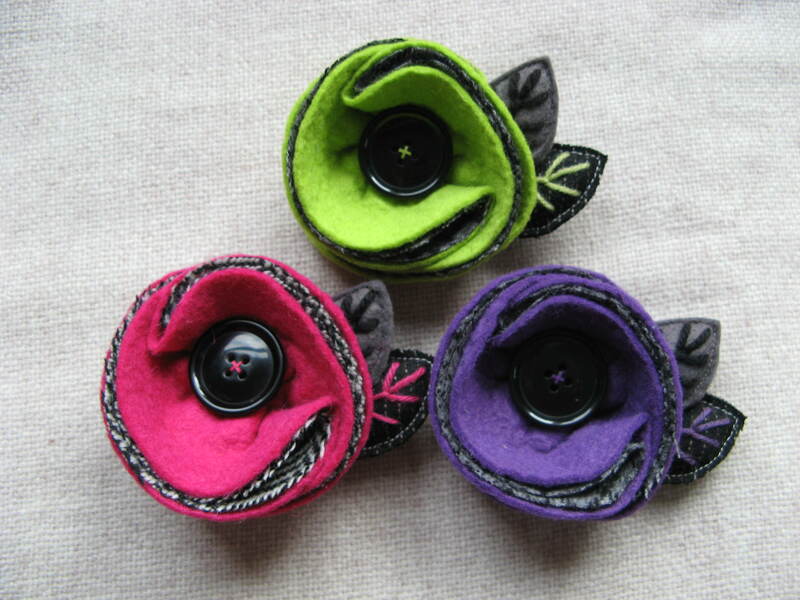 They have two padded leaves with hand-stitched details in wool. 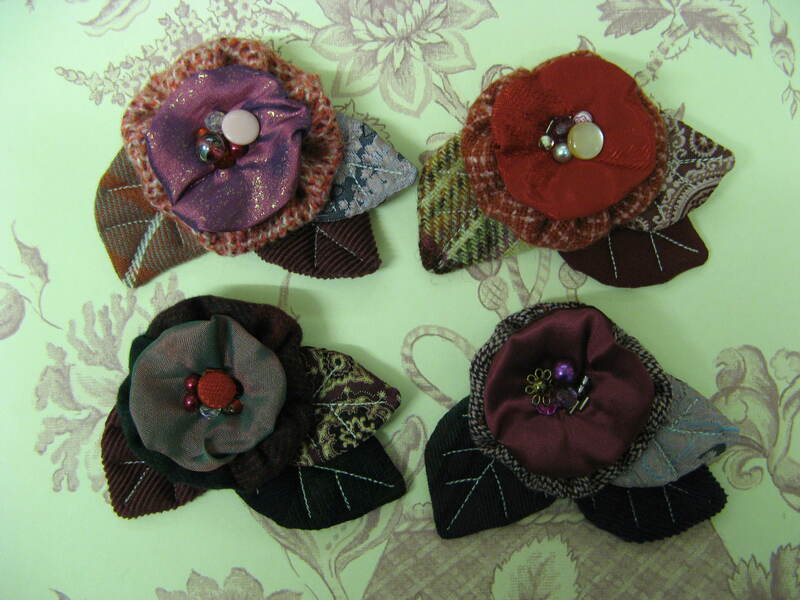 These are a few that I made this week. 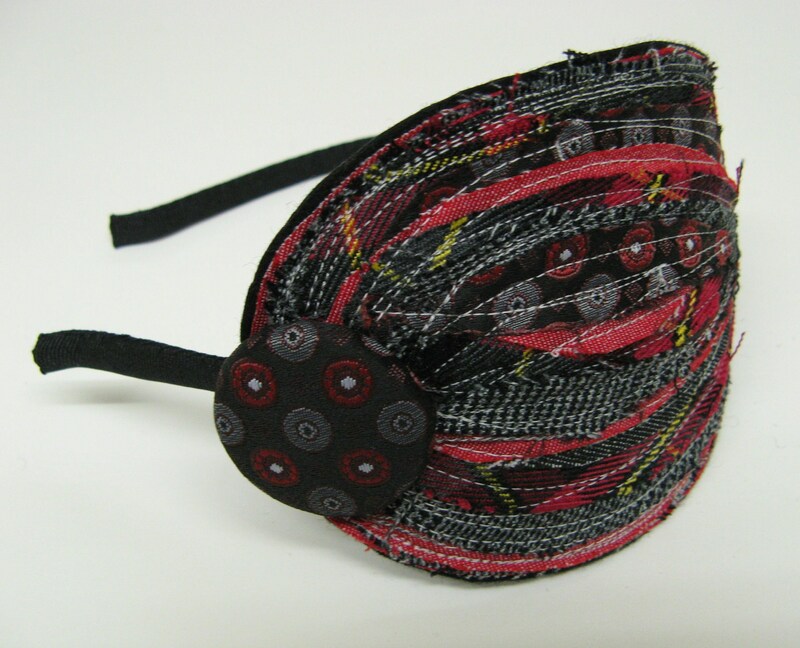 Red is the most popular colour, with bright pink the runner up, but I enjoy working with all the bright colours, especially when contrasted with grey and black. 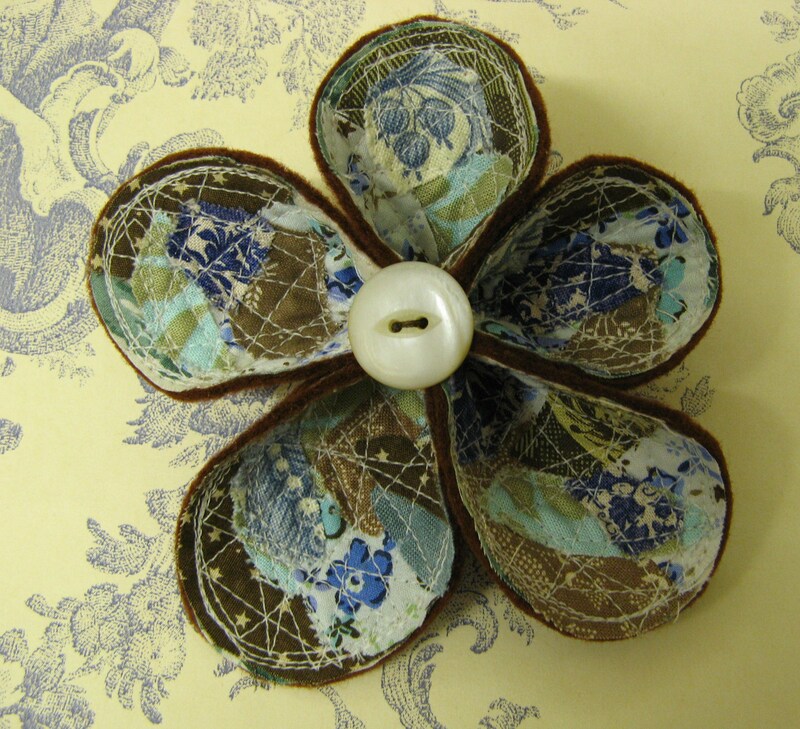 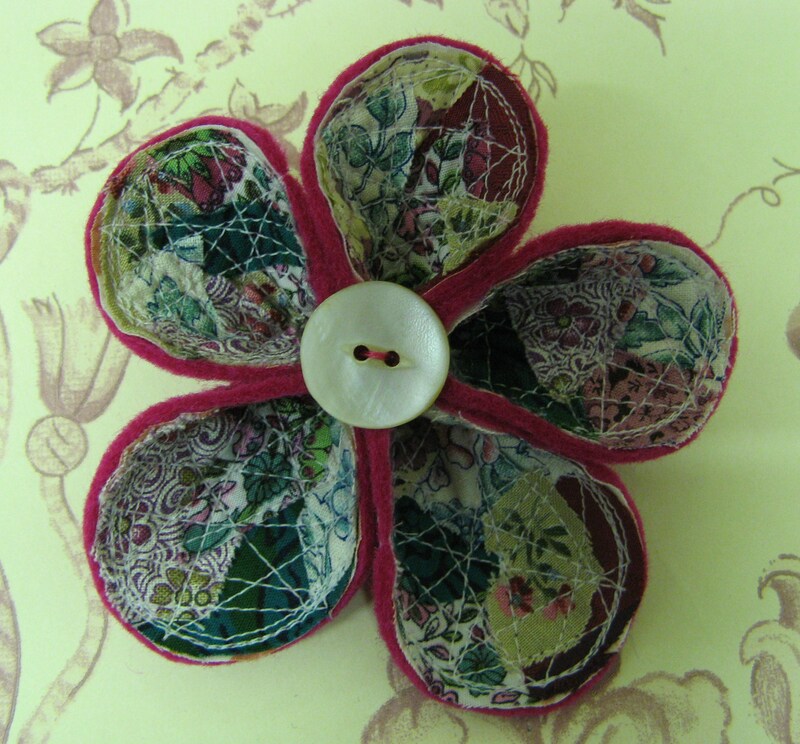 The layered, stitched flowers that I made for the Summer were very popular, so I wanted to make a Winter version. 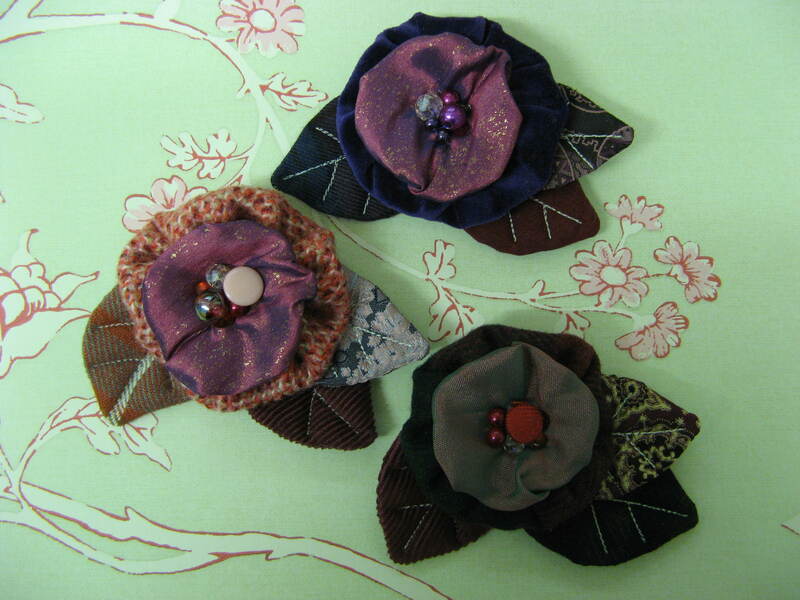 I made these flowers this week. 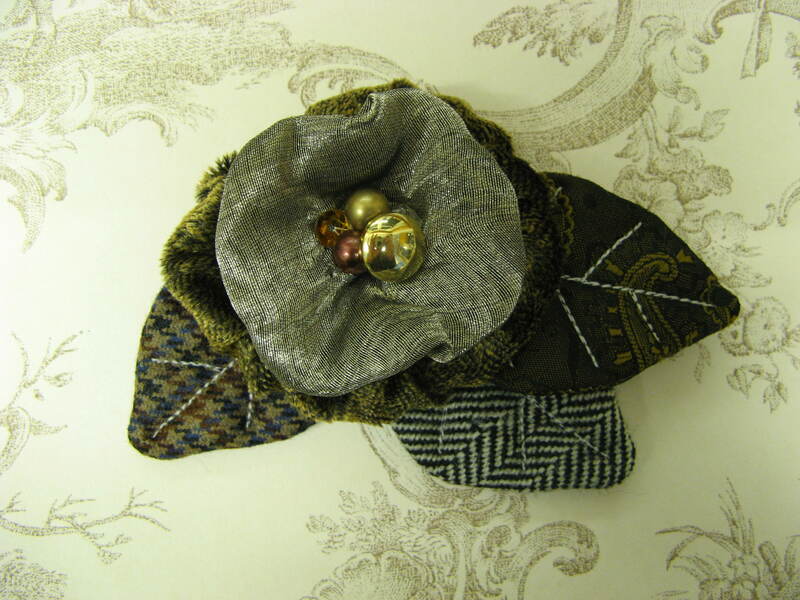 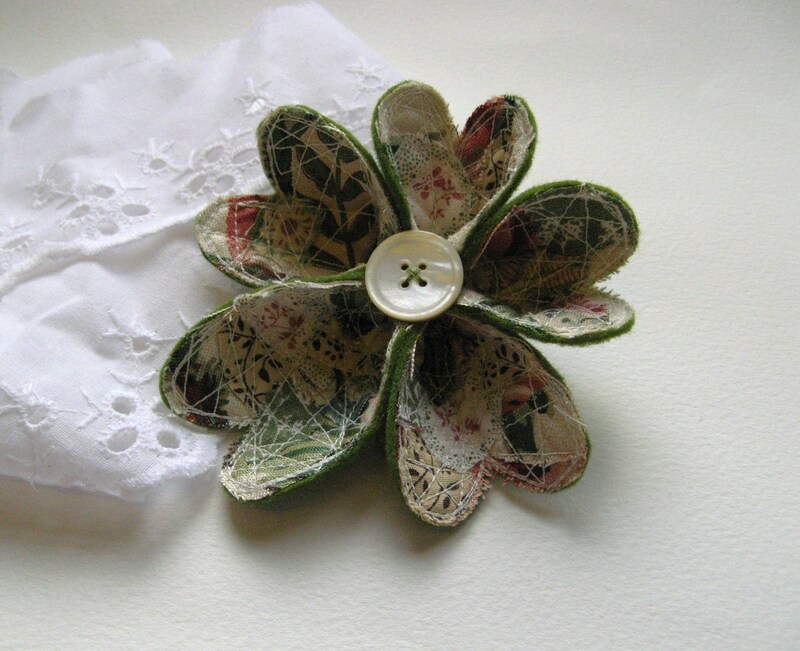 Instead of cottons, I layered tiny scraps of recycled tweed over felt to make the petals. 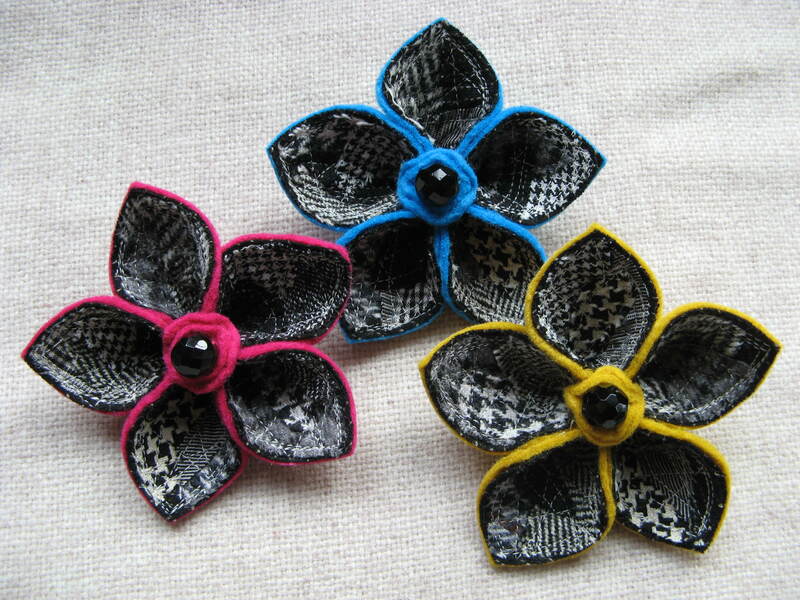 I thought the various black and white tweeds were a great contrast with the bright coloured felt. 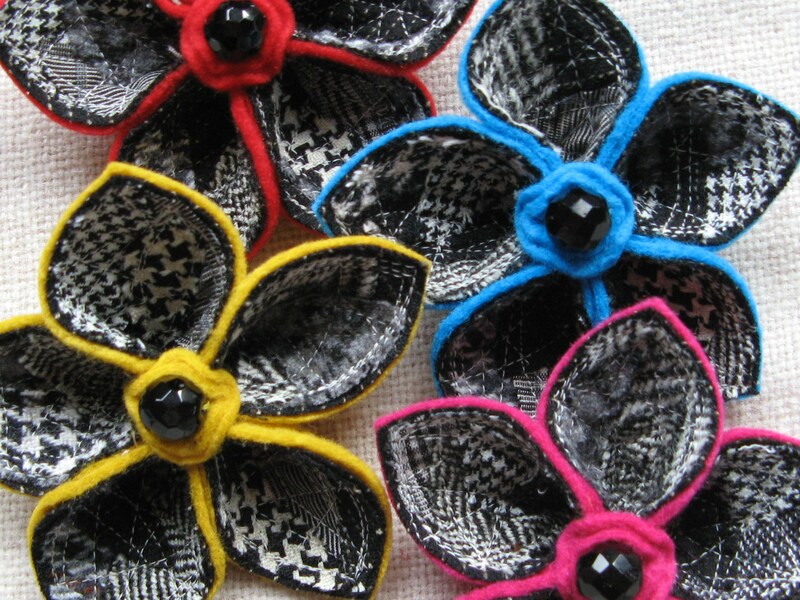 They have shiny, faceted black beads for centres which were taken from an old necklace. 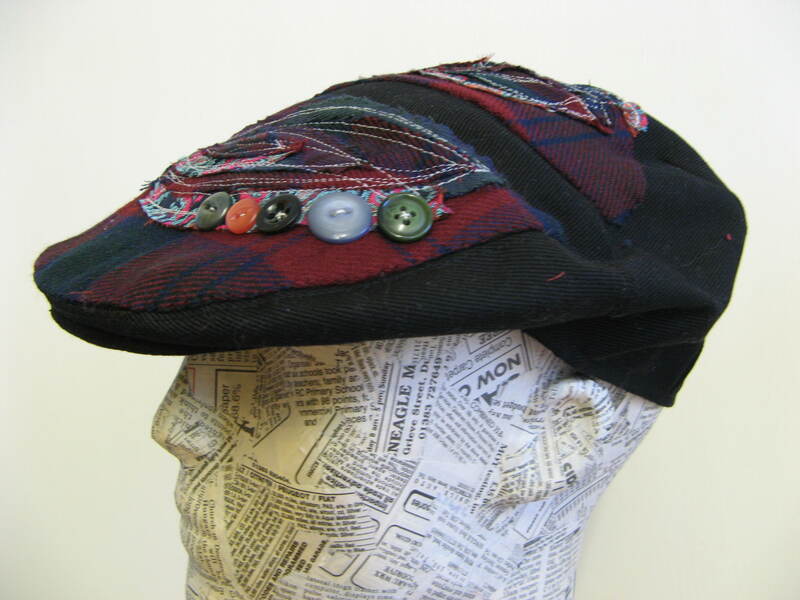 Layering the black and white tweeds reminded me of layers of newsprint when working with papier mache. 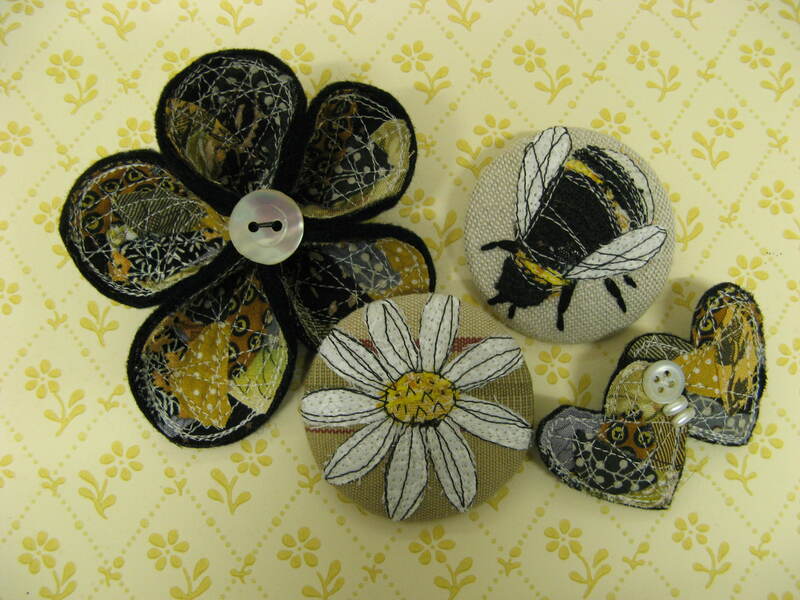 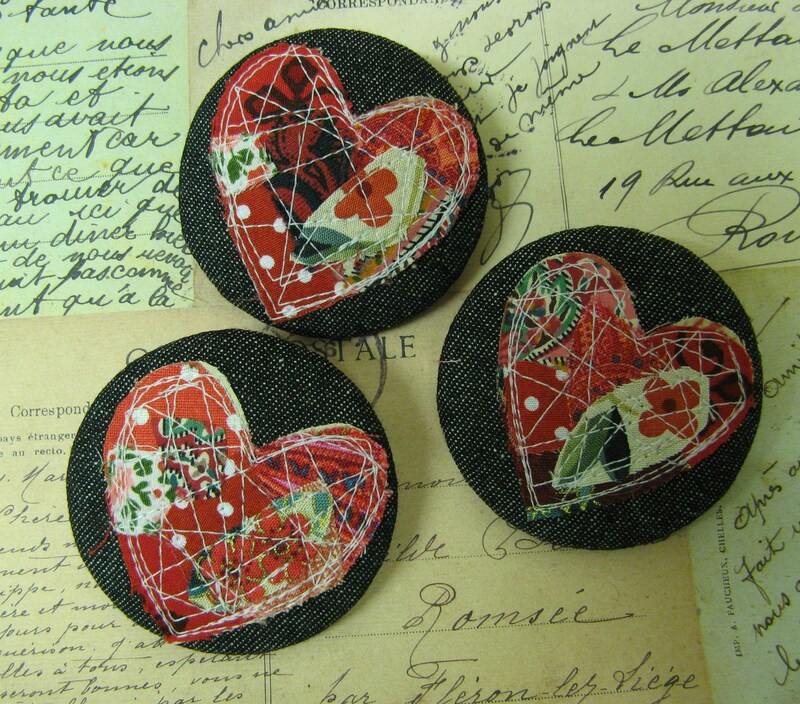 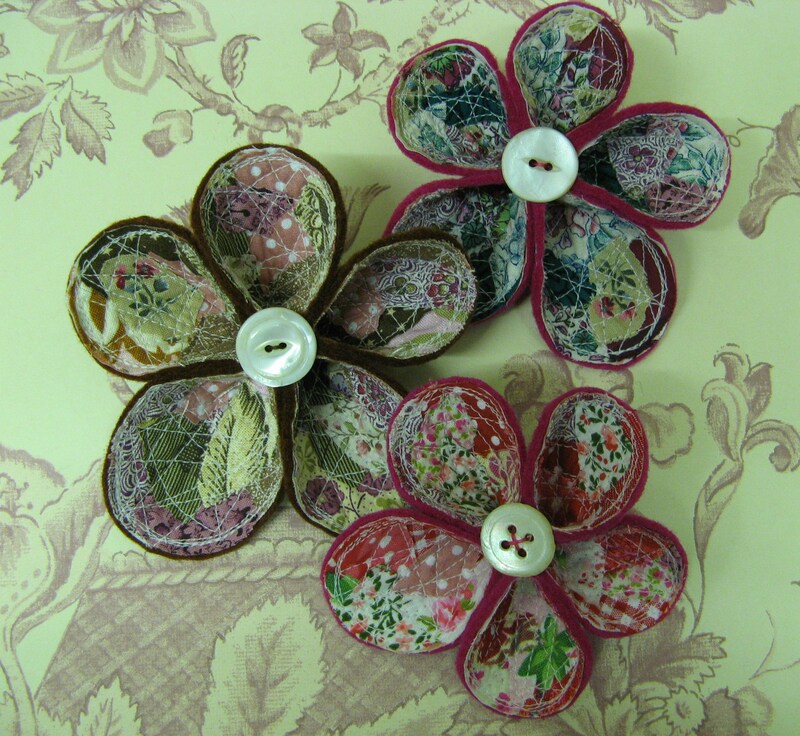 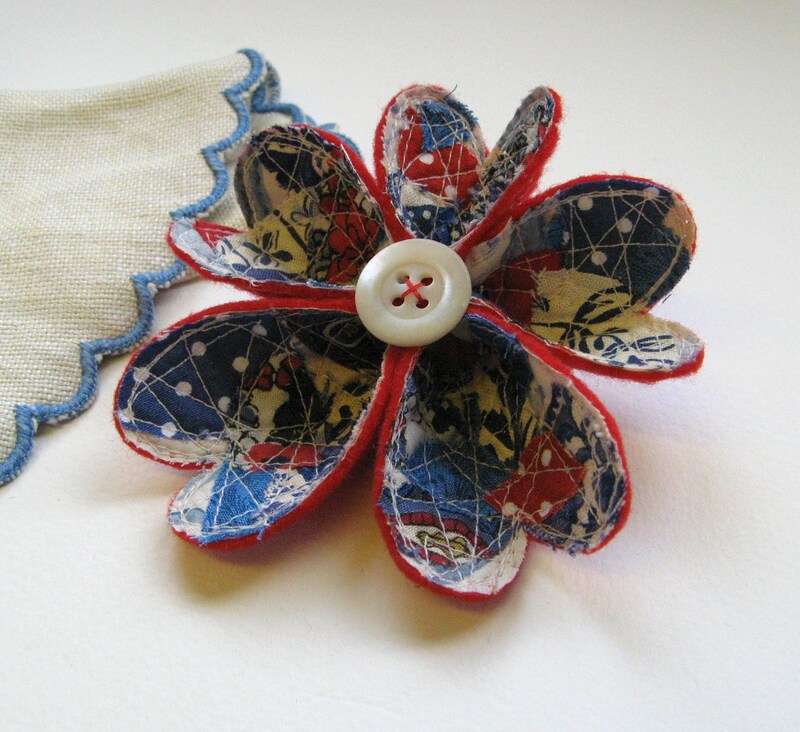 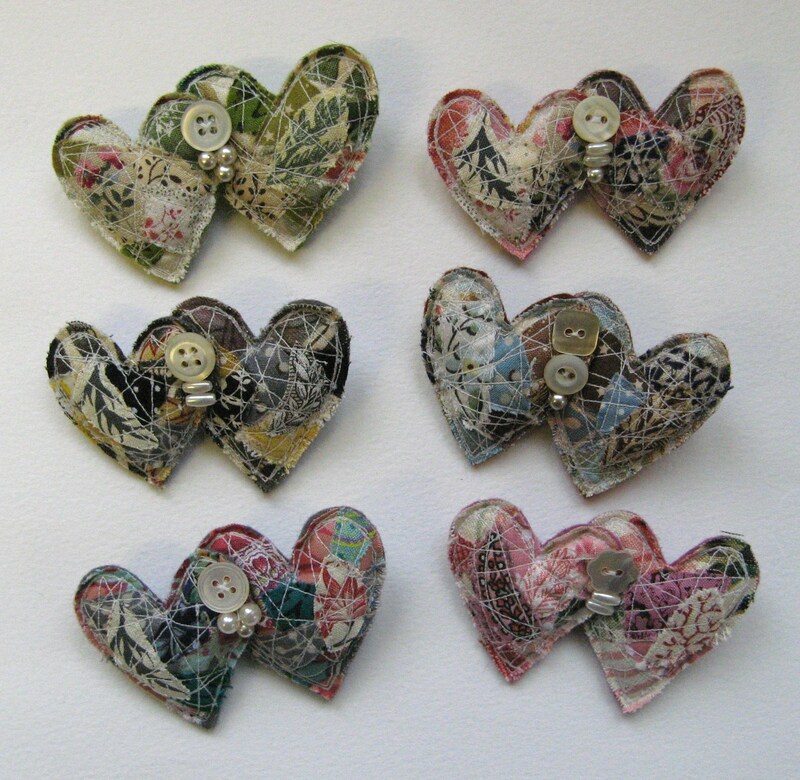 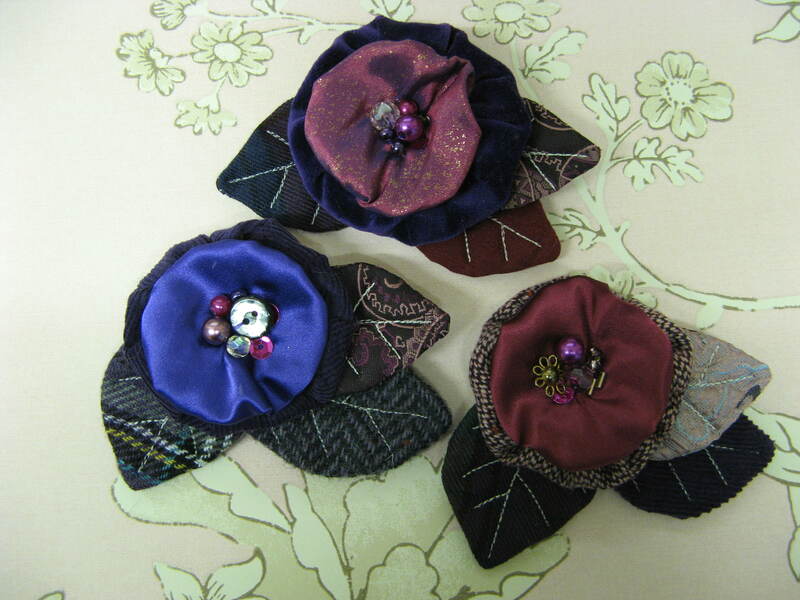 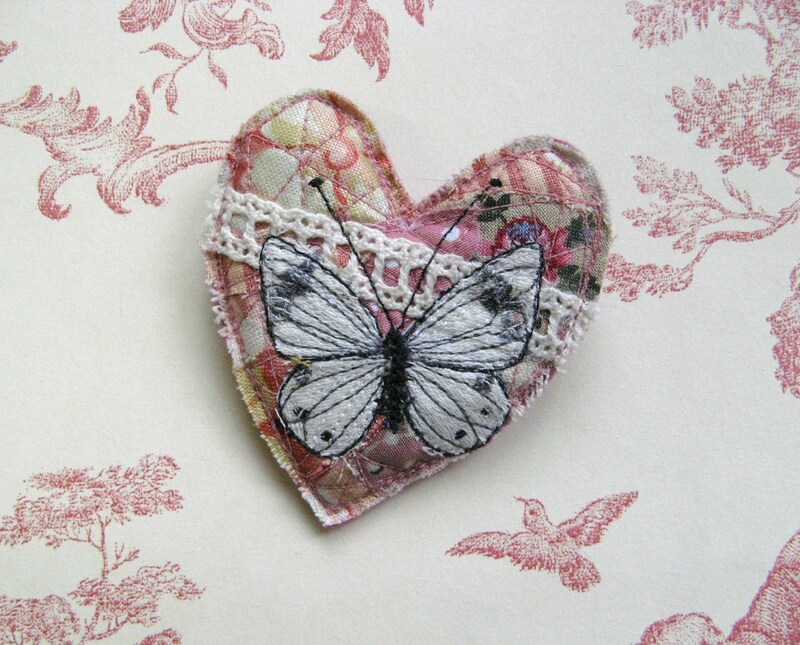 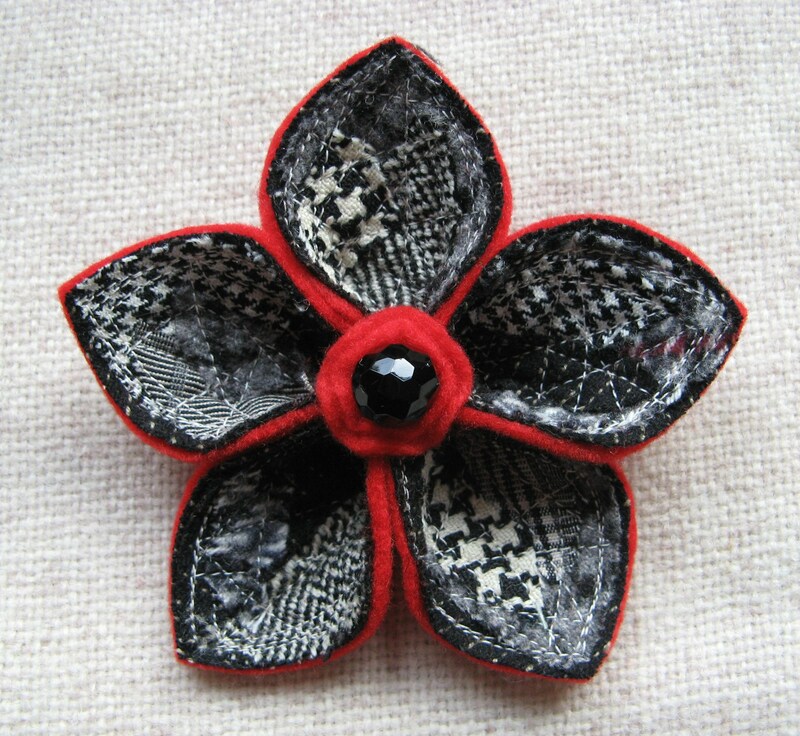 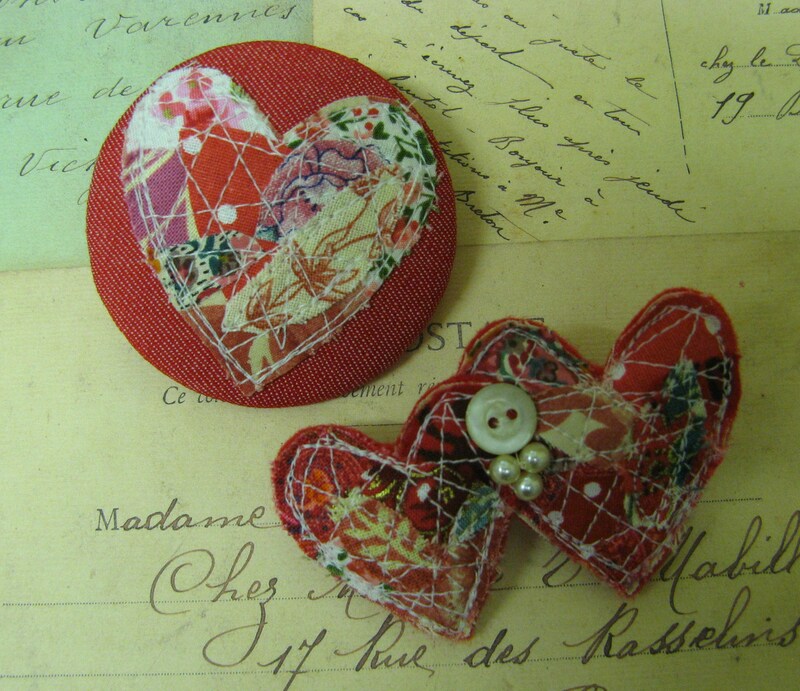 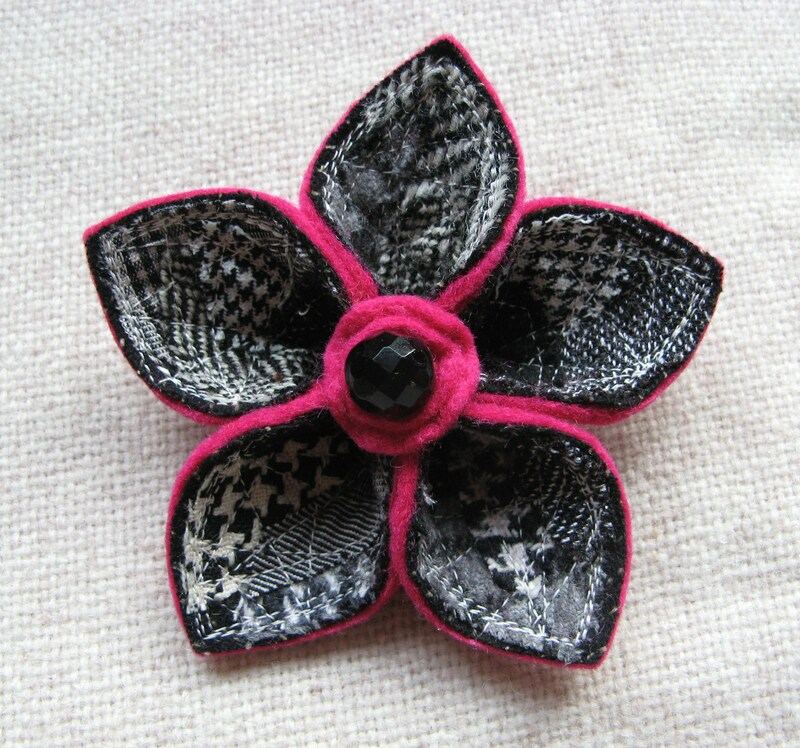 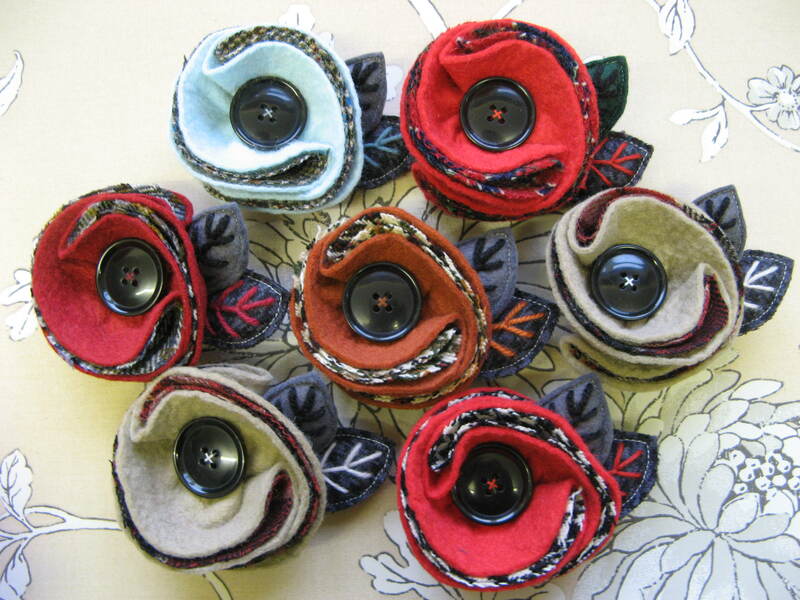 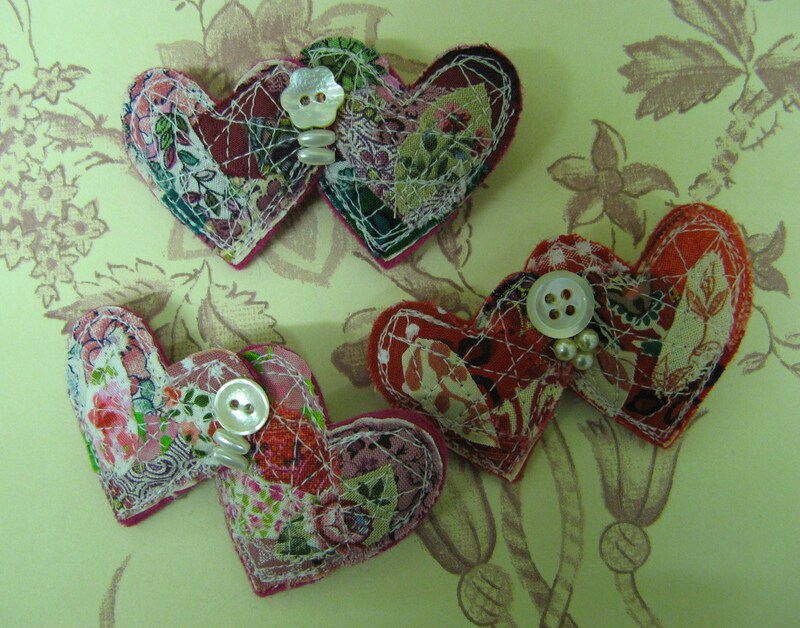 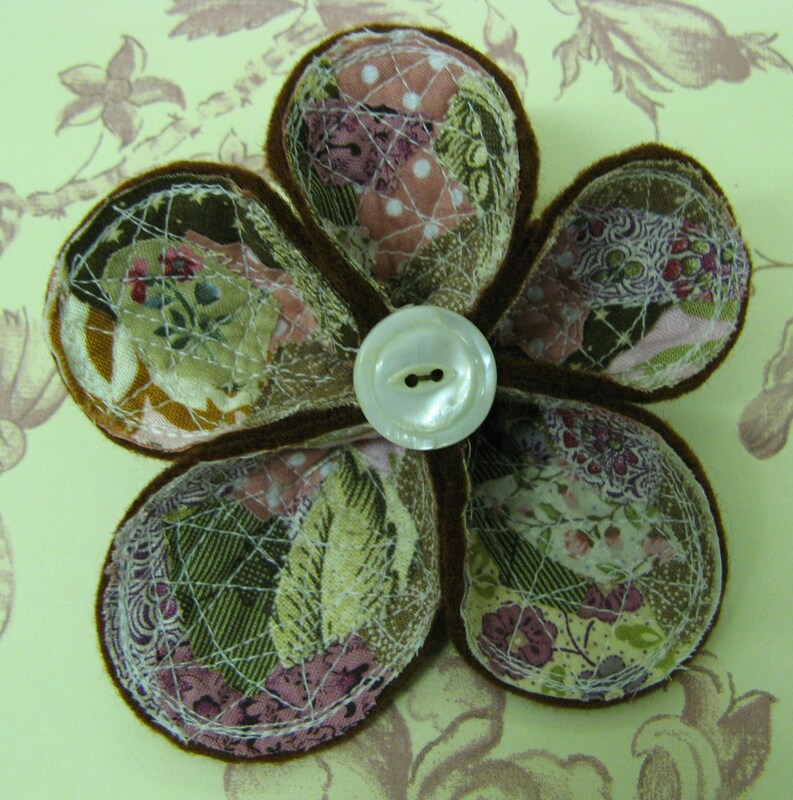 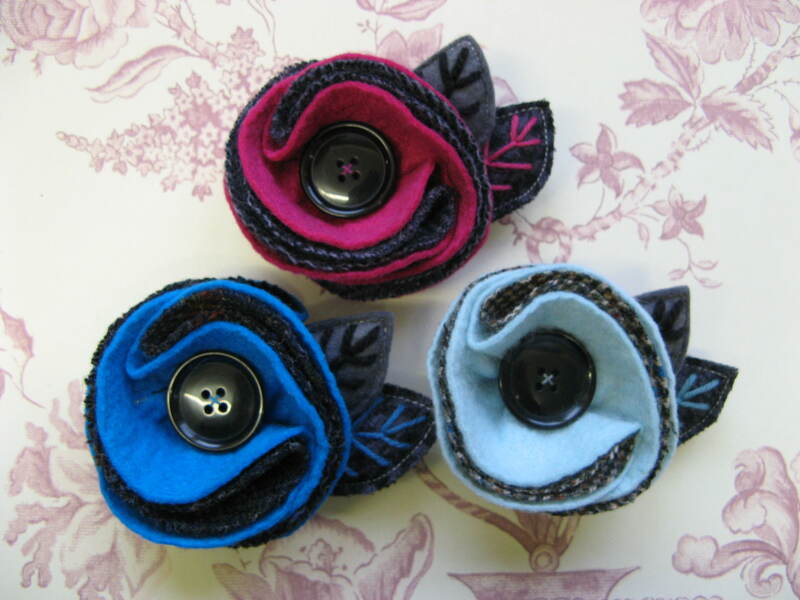 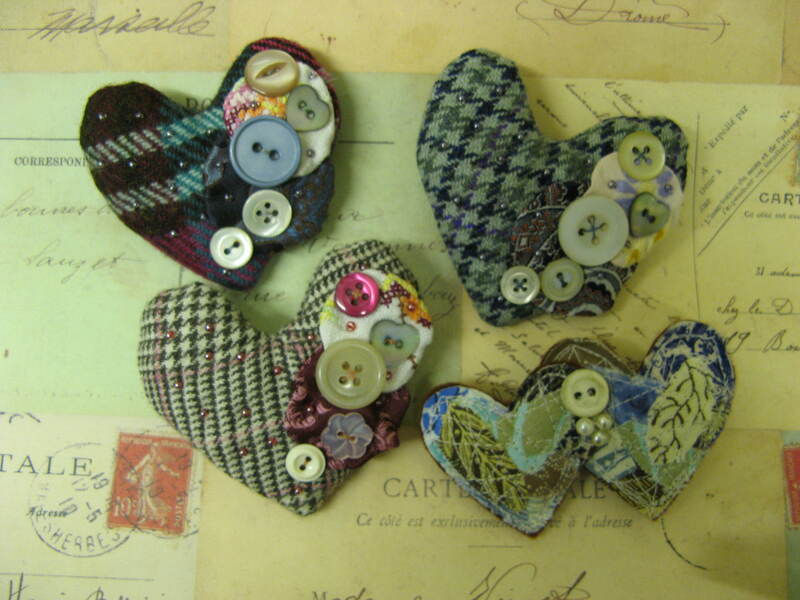 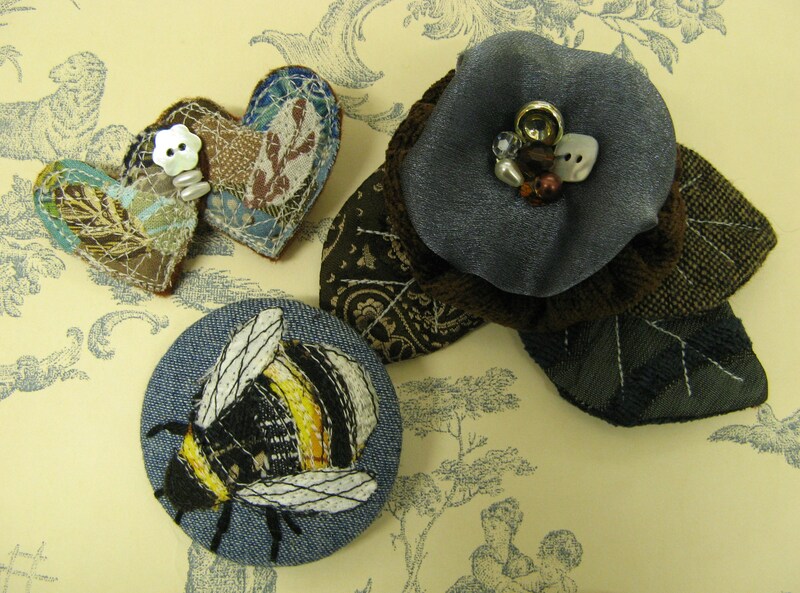 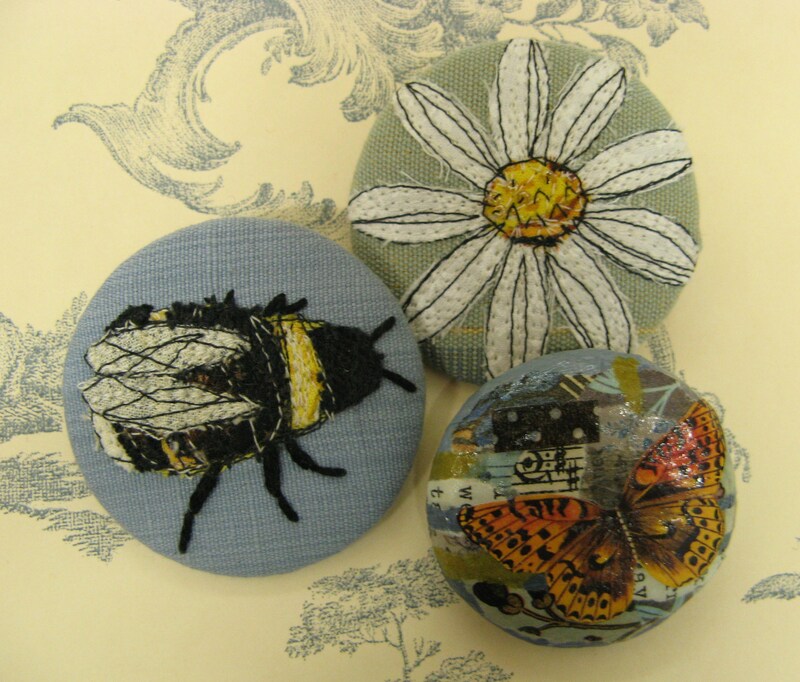 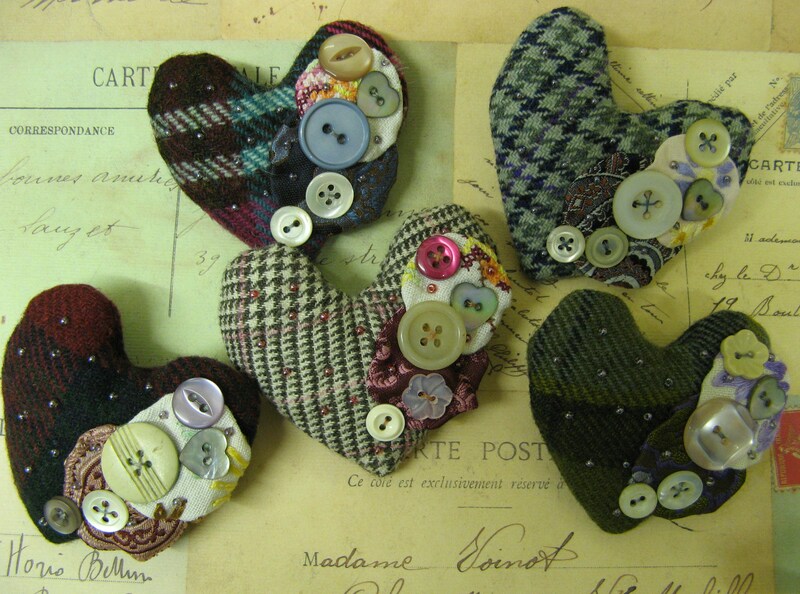 I think these flowers go really well with my felt poppies, they`re both perfect for cheering up a black Winter coat. 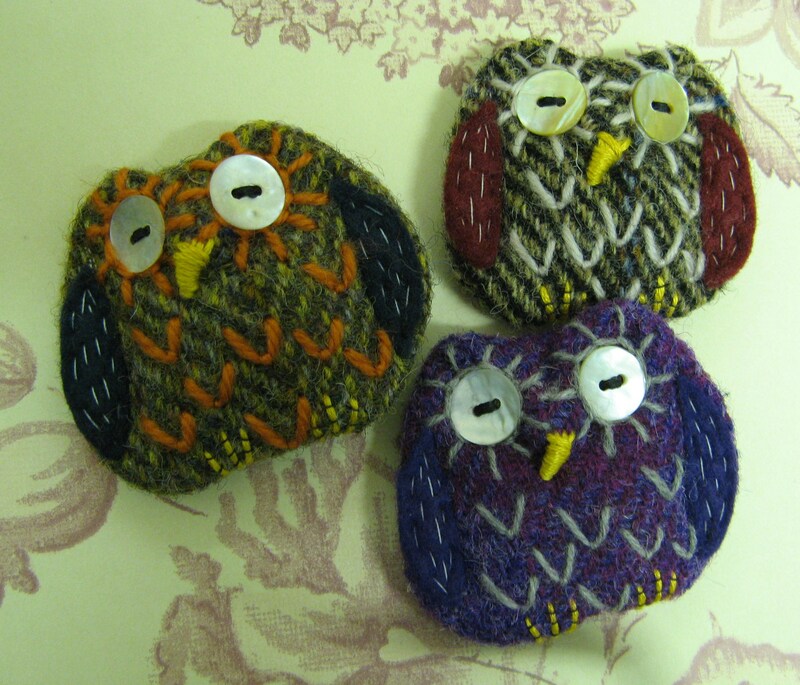 My first wee batch went straight into Flux in Leith, but I`m going to make lots more, including some more muted coloured ones. 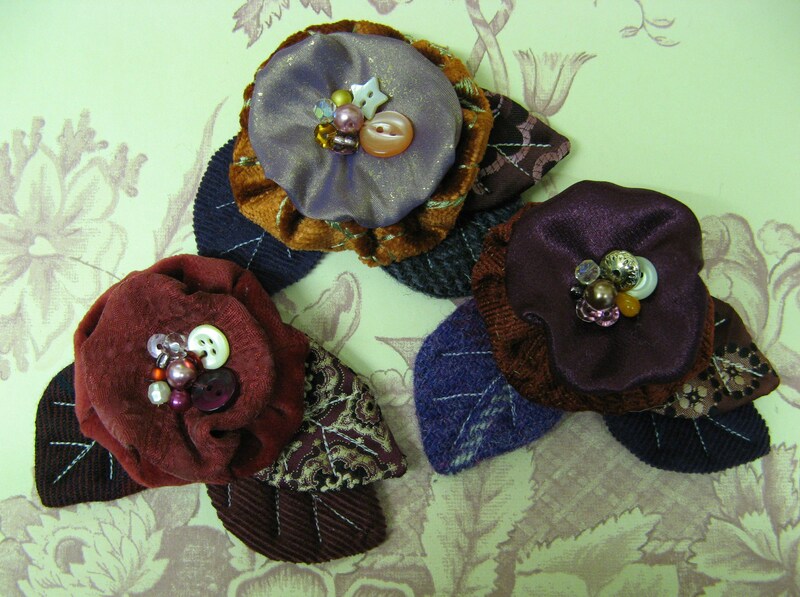 It`s been a while since I`ve had time to make anything new, so I really enjoyed making these.